Meditation is an umbrella term that encompasses a family of practices. In state of meditation there is total relaxation of body & mind. Control of breathing & doing nothing are the basic steps. The practice of meditation creates a balanced, rhythmic & naturally flowing pulsation of life through every part of the body. It transfers the struggling- stressful & exhausted life into a peaceful one. That life is full of health, creativity, love & compassion. Such type of greatest adventure only 'human mind' can undertake. For meditation, there is no need to escape from the life. It is a simple technique that does not require sophisticated or complicated amenities. Aim and objectives: To assess the accuracy of Tri Auto ZX as an apex locator and its automatic apical reverse mechanism (AAR) set at 0.5, 1 and 1.5mm using Pro-Taper instruments. Materials and Methods: Forty-five freshly extracted single rooted human teeth were used and divided into three groups: (1) Teeth prepared using AAR set at 0.5mm (2) Teeth prepared using AAR set at 1mm (3) Teeth prepared using AAR set at 1.5mm.Tri Auto ZX (J. Morita, Kyoto, Japan) was activated to auto mode and biomechanical preparation was carried out using protaper instruments till size F3 for each group. The F3 instrument was stabilized at the position and roots were ground longitudinally until exposure of the instrument. Under stereomicroscope the distance between the file tip and apical foramen was measured. Results: The results showed the mean value for Groups was 0.4617mm, 0.8976mm and 1.5277mm respectively. Statistical analysis between the groups revealed that Groups I and III showed no statistical difference i.e (p<0.05). Group II showed the significance at 5% significance level. Conclusion: Tri Auto ZX showed to be an acceptable device for determining root canal length and instrumentation. Using a preset distance set at 0.5 and 1.5mm were more accurate than set at 1mm. Aims & Objectives: Periodontal disease comprises a group of inflammatory conditions of the supporting tissues of the teeth that are caused by bacteria. The present study was undertaken to evaluate whether Oratest could be used as a sensitive indicator of plaque levels and gingivitis. Material and Methods: Hundred caries free patients visiting the out-patient department of A.E.C.S. Maaruti College of Dental Sciences and Research Centre, Banglore were selected according to predetermined selection criteria. The study consisted of two clinical stages: Stage 1. Recording of Plaque Index (Loe, 1967) and Gingival Index (Loe & Silness 1963) in the subjects. Stage 2. Performance of the Oratest and recording the scores in the same subjects. The Oratest was performed by rinsing the mouth with sterilized UHT (Ultra high temperature) milk. About 3 ml of expectorated milk was added to a test tube containing the 0.12 ml of 0.1% methylene blue. The time required for colour change from blue to white attained at the bottom of the tube was recorded. 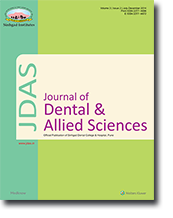 Plaque Index, Gingival Index and Oratest scores were compared using Student t test. Pearson correlation test was applied to assess correlation between the indices and Oratest scores. Results:The results of the study showed that as age increased plaque and Gingival Indexes also increased whereas Oratest scores decreased. No significant difference between males and females was found in mean values of Plaque Index, Gingival Index and Oratest scores. Negative correlation was seen between Plaque Index and Oratest scores (r = 0.724) and also between Gingival Index and Oratest scores (r = 0.728). Conclusions: The study showed high correlation between the plaque and gingival indices and Oratest scores. This study validates Oratest as a predictable & sensitive test to assess periodontal disease. Aims & Objectives: 1.To study the time course of plasma glucose, in gestational diabetic and normal pregnant women. 2.To compare maternal outcome and fetal outcome in gestational diabetic and normal pregnant women. Materials and Methods: Five hundred pregnant individuals visiting the Antenatal Clinic of Rural Medical College, Loni in either half of the gestation were screened and gestational diabetes mellitus was diagnosed according to the WHO criteria. Results: The scope of diabetes and pregnancy encompasses not only diabetics marching through pregnancy but also, any form of abnormal glucose tolerance developing during gestation, termed as gestational diabetes, abnormal glucose tolerance of any etiology recognized or unrecognized starting before pregnancy or revealed during pregnancy, is associated with a high risk of a poor maternal and fetal outcomes. In our study we found a significantly higher incidence of caesarean section in-patients with GDM when compared with the normal group (67% versus 25%, P <0.001). In GDM cases, we observed fetal macrosomia, high birth weight etc. Naturally these are the factors, which add to the pre-existing unfavourable maternal factors affecting the process of labour adversely. We observed a significant difference in the incidence of preterm labour in between the GDM and non-GDM groups (22% Vs 13%, p<0.05). These individuals underwent a process of preterm labour at a gestational age of 32+3 weeks. Hyperglycemia and polyhydramnios are held responsible for preterm labour. The incidence rate of PIH was more in subjects with GDM as compared to the other group. However this difference failed to prove statistically significant at 5% level of significance. Though we did not get a significant difference in occurrence of PIH in between the GDM and non-GDM groups, we do agree with the comment that hyperglycemia earlier in the pregnancy is associated with greater incidence of PIH as three of the four cases who were diagnosed to have GDM in first half of pregnancy showed a presence of PIH. The present study revealed no association between Polyhydramnios and GDM. We found 16.65% incidence of polyhydramnios in GDM and 4.35% in non-GDM women. In our study maternal hyperglycemia was present in all cases of polyhydramnios so that osmotic imbalance could be involved in the pathogenesis of polyhydramniosis. Conclusion: Diagnosis of gestational diabetes and subsequent treatment to attain normoglycemia will definitely lead to satisfactory maternal and /or fetal outcome. Recently free radicals have attracted tremendous importance in the field of medicine including dentistry and molecular biology. Free radicals can be either harmful or helpful to the body. When there is an imbalance between formation and removal of free radicals then a condition called as oxidative stress is developed in body. To counteract these free radicals body has protective antioxidant mechanisms which have abilities to lower incidence of various human morbidities and mortalities. Many research groups in the past have tried to study and confirm oxidative stress. Many authors also have studied role of antioxidants in reducing oxidative stress. They have come across with controversial results and furthermore it is not yet fully confirmed whether oxidative stress increases the need for dietary antioxidants. Recently, an association between periodontitis and cardiovascular disease has received considerable attention. Various forms of antioxidants have been introduced as an approach to fight dental diseases and improve general gingival health. The implication of oxidative stress in the etiology of many chronic and degenerative diseases suggests that antioxidant therapy represents a promising avenue for treatment. This study was conducted with the objective of reviewing articles relating to this subject. A Pub Med search of all articles containing key words free radicals, oxidative stress, and antioxidants was done. A review of these articles was undertaken. In the era of HIV/ AIDS it is essential to follow the infection prevention protocols in all health care settings including dental settings. The present review article highlighted the various preventive protocols to be followed in dental settings. It includes right from the simple hand hygiene to biomedical waste segregation. The exploration of new methods and techniques for the diagnosis of malignant tumours has always attracted the attention of scientists. The development of adjunct tools to facilitate the non invasive screening of high risk lesions in real time has the potential to significantly improve our ability to reduce the dismal morbidity and mortality of oral cancer. Despite easy accessibility of the oral cavity to examination, there is no satisfactory method to adequately screen and detect precancers non-invasively. The current method of oral cancer diagnosis clinically relies heavily on visual examination of the oral cavity. However, discerning potentially malignant and early malignant lesions from common benign inflammatory conditions can be difficult at times. There is a need for an objective method that could provide real- time results and be routinely applied to a large population. Though science is yet to present such a perfect technique, Optical Biopsy Systems developed using knowledge of light and tissue interaction, can provide a plausible option. Healthy teeth & gingival tissues are important for esthetic appearance & good functional ability of a person's face. Abnormal frenal attachment may lead to oro-facial problems. Abnormal lingual frenum (tongue-tie) which is commonly seen is a known cause for speech & masticatory impairment. This case report discusses a rare case of abnormal labial frenum which affected speech and mastication of a young child. Very young children are at risk of swallowing or aspirating numerous household things. This risk is enhanced during dental procedures of these children as they tend to be very unco-operative due to their age and lack of maturity to understand the importance of the treatment. Use of physical barriers, sedation or general anesthesia is not practically possible in every child scheduled for dental treatment. Dentist must be able to manage emergency situations in which patients accidentally swallow dental instruments or materials during treatment and procedures. This article presents ingestion of dental objects in 3 children and attempts to discuss the management and prevention of such mishaps. A case report of a patient suffering from a relatively uncommon condition called 'Phantom Bite' is presented with the aim to provide the fellow orthodontists & general dentists with an overview of potential diagnostic & treatment challenges posed by patients who present with occlusal dysesthesia. A clinical case illustrating the nature of this condition is presented & the problems associated with the management of affected patient are discussed. The patients suffering from Phantom bite syndrome have one symptom in common ; that is, they feel that their bite is not correct & their iterative belief in the need for dental treatment to accomplish correction. Since this condition is associated with an underlying psychological problem, treatment of such patients poses a greater challenge to the operator. Thus, it can be concluded that 'Phantom Bite' or 'Occlusal Dysesthesia' is seen as a form of somatoform disorder where dental treatments should be avoided & instead the focus must be on addressing the somatoform disorder through behavior change. Primary oral malignant melanoma usually presents as a dark brown or black lesion. It is a rare malignancy, accounting for less than 1% of all melanomas and 1.6% of all head and neck malignancies, thus forming up to 0.5% of all oral malignancies in the world literature. In general, the prognosis of oral melanoma is poor and worse than that of cutaneous melanoma. The preferred treatment is radical surgery alone or in combination with radiotherapy, chemotherapy, and immunotherapy and immunomodulatory agents. A case of Oral Malignant Melanoma is presented here which was undetected during the first visit to the hospital. When a simple oral surgical treatment was carried out in that region, it resulted in the appearance of a massive pigmented lesion which was histopathologically diagnosed as malignant melanoma. This paper is presented to re- emphasize the fact that any pigmented lesion in the oral cavity should be viewed with suspicion and proper investigation (biopsy) should be carried out to rule out any untoward experiences later. Supernumerary tooth is one that is additional to the normal series and can be found in almost any region of the dental arch. They may be single, multiple, unilateral or bilateral erupted or unerupted and in one or both jaws. Mesiodens is the most common type of supernumerary tooth found in the premaxilla between two central incisors. Presented here is a case of ten year old male child with supplemental mesiodens with talons cusp erupted in the oral cavity causing malocclusion and an another horizontally impacted mesiodens near the nasal floor. Mesiodens was extracted and esthetic reconstruction of the patient was done by bringing left maxillary central incisor to correct position by orthodontic treatment.